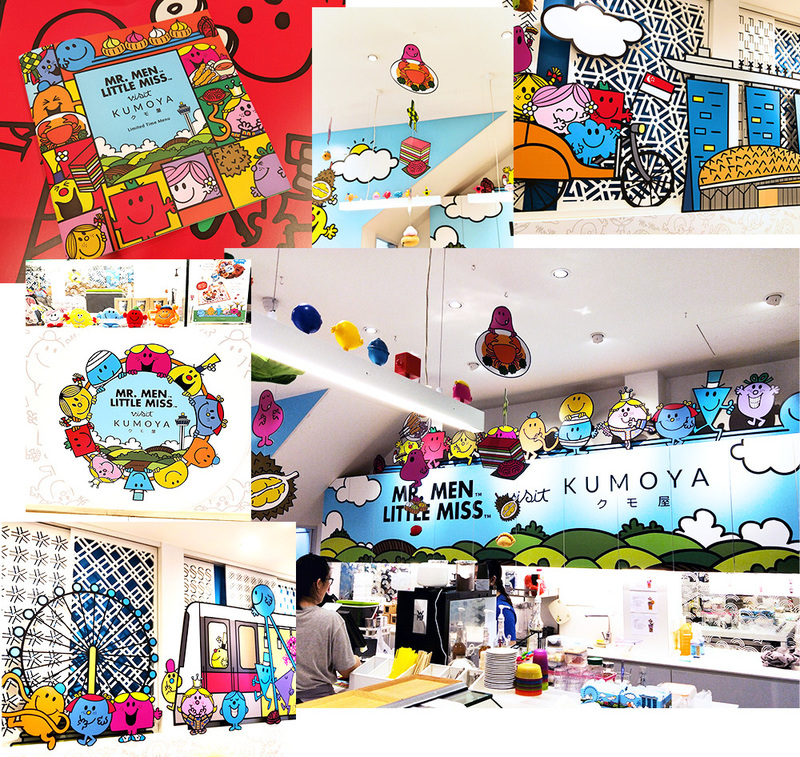 Bye tokidoki, it’s time for Mr. Men and Little Miss to visit Kumoya! 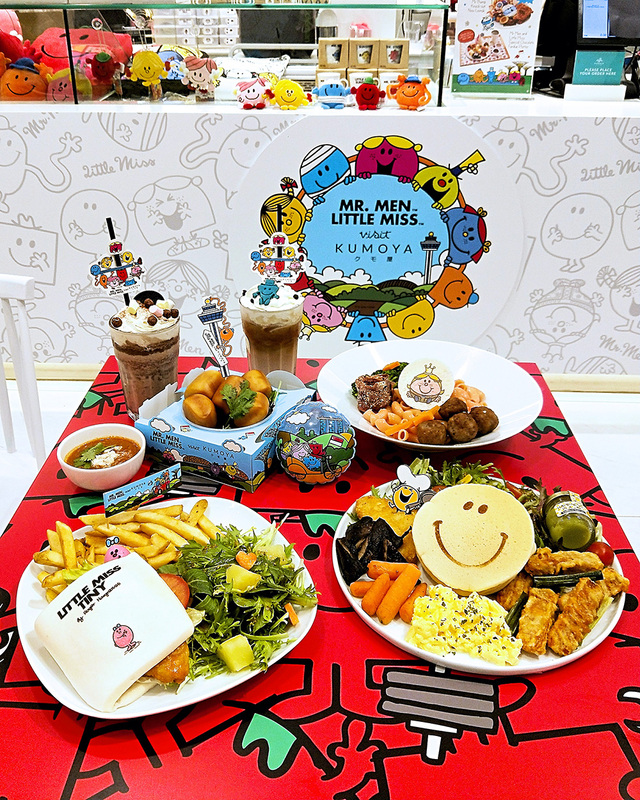 Kumoya’s a cafe that sees different characters come in for a visit, and now it’s time to welcome the next visitorsThe Mr Men and Little Miss gang were a staple in our childhoods and now Kumoya’s brought them to life through a pop-up cafe. Even if you didn’t read the books, you would have recognised the square white books featuring the various characters on the book shelves. 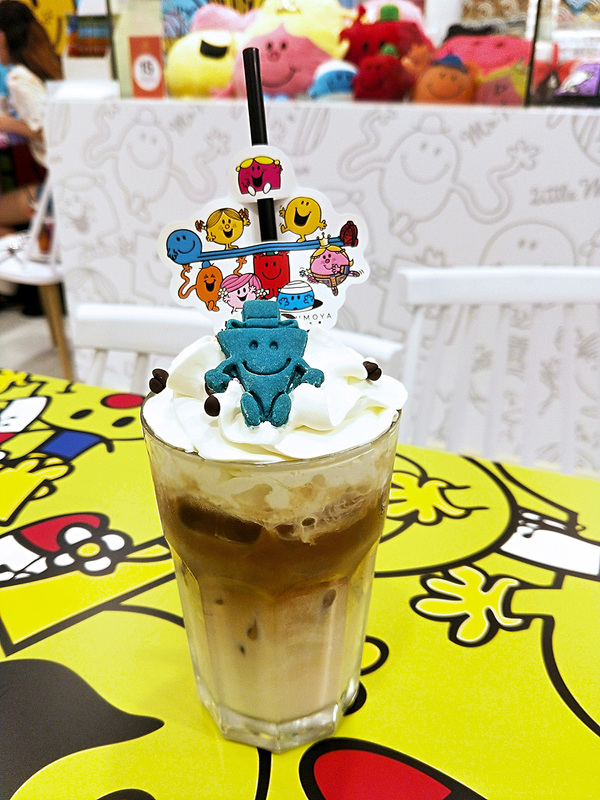 Feeling a little bit like a kid, I knew that I had stepped into Virtual Happyland the moment I entered the cafe. 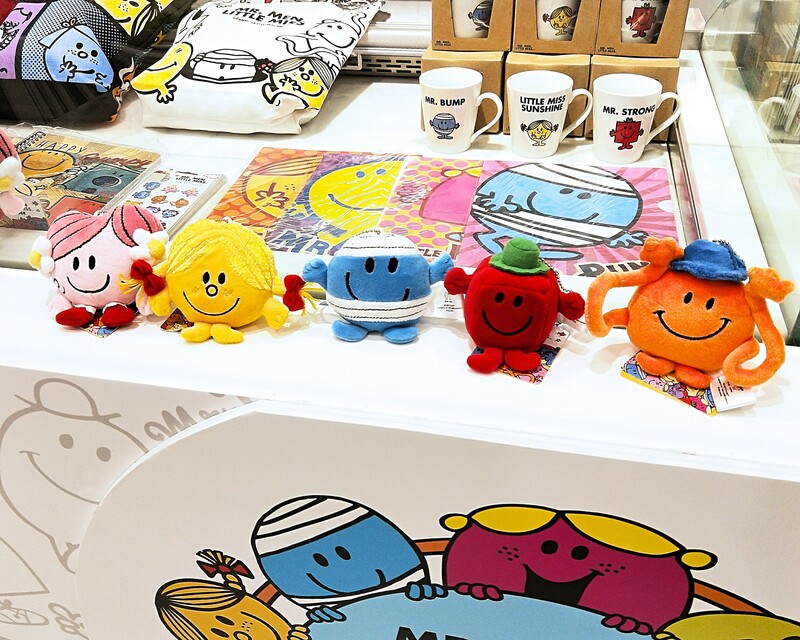 With Mr Men and Little Misses hiding EVERYWHERE – on the walls, tables, even hanging from the ceiling and hiding in the food – I spent way too long trying to identify all the characters so that I won’t feel like I’m turning into Mr Forgetful. 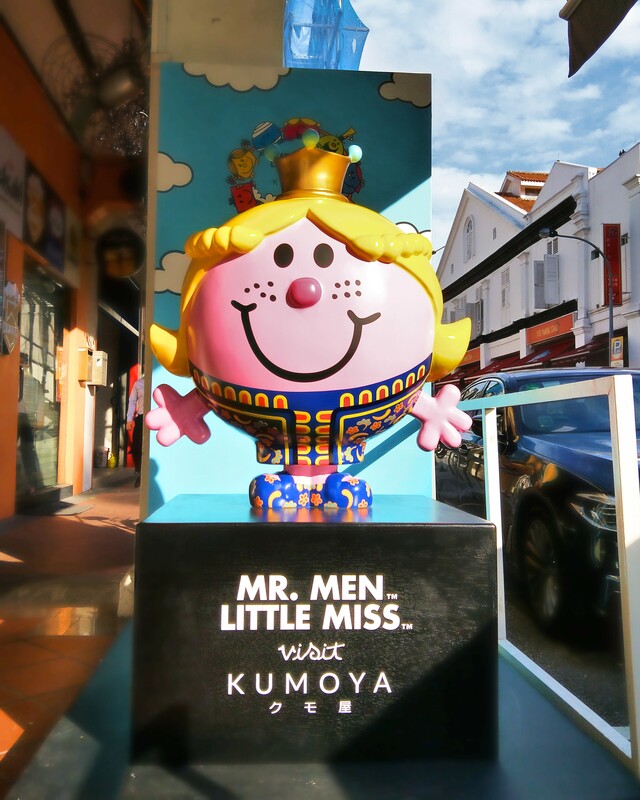 Instead of bringing the Mr Men universe to Kumoya, the cafe has been recreated with local iconic spots that the Mr Men and Little Miss visited when they are here. Little Miss Princess (not Little Miss Singapore) has even had the honor of donning her own Singapore inspired kebaya to greet customers at the door. 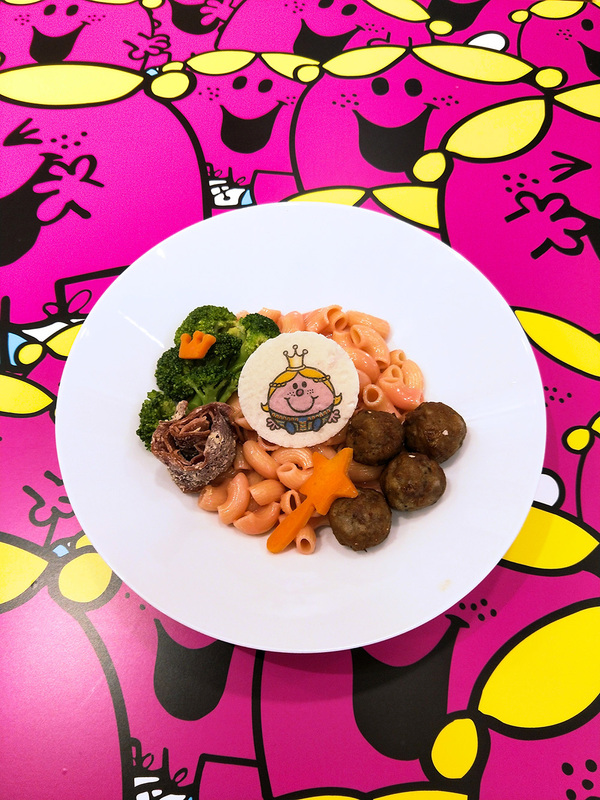 We’ve eaten at plenty of themed cafes, and we can safely say that most themed cafes are overpriced for the mediocre dishes that we are being served. 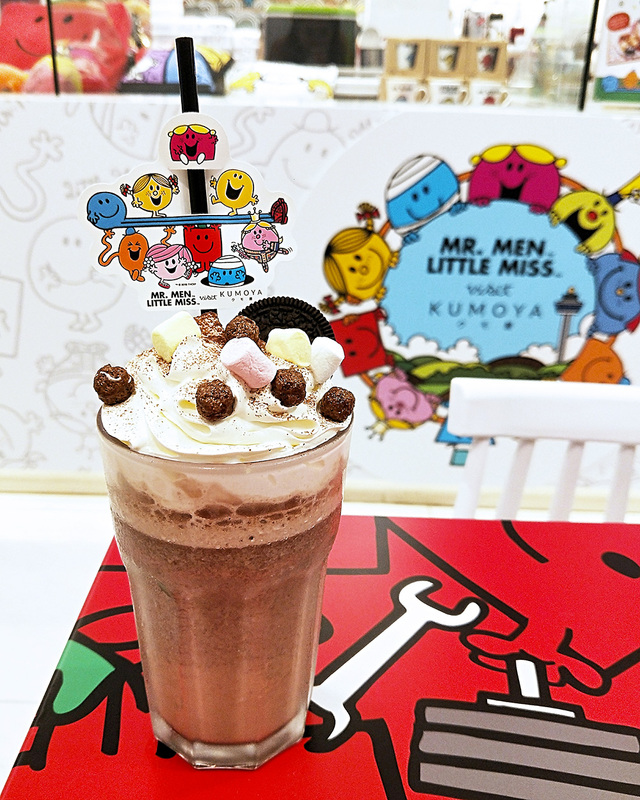 Surprisingly, I thought that the food at the Mr Men & Little Miss x Kumoya cafe was pretty decent. 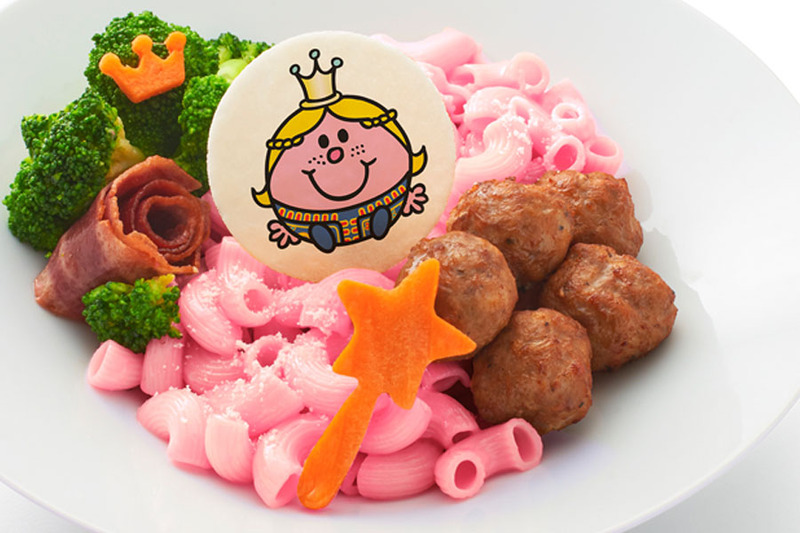 The menu is mostly inspired by Asian influences, and was created by Little Miss Bento. For appetisers, there is the usual Hand-cut Truffle Fries ($11.90) and Hand-cut Nacho Cheese Fries ($10.90). We decided to try the Fried mantou with house-made Chili Crab Dip, and you could see actual chunks of crab in the deliciously thick sauce that packs a punch without being too spicy. 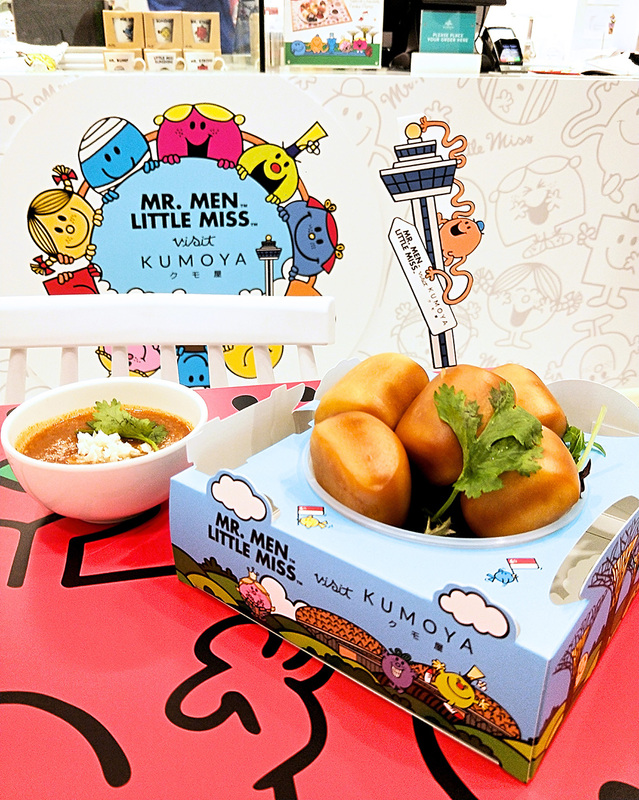 There’s also an option to get fries with the same chilli crab sauce for those potato-lovers. Other appetisers include a Tempura Mackerel Otah with Sambal Mayo ($12.90) and Chicken Corn Sticks with Nacho Cheese ($12.90). Now onto the mains. 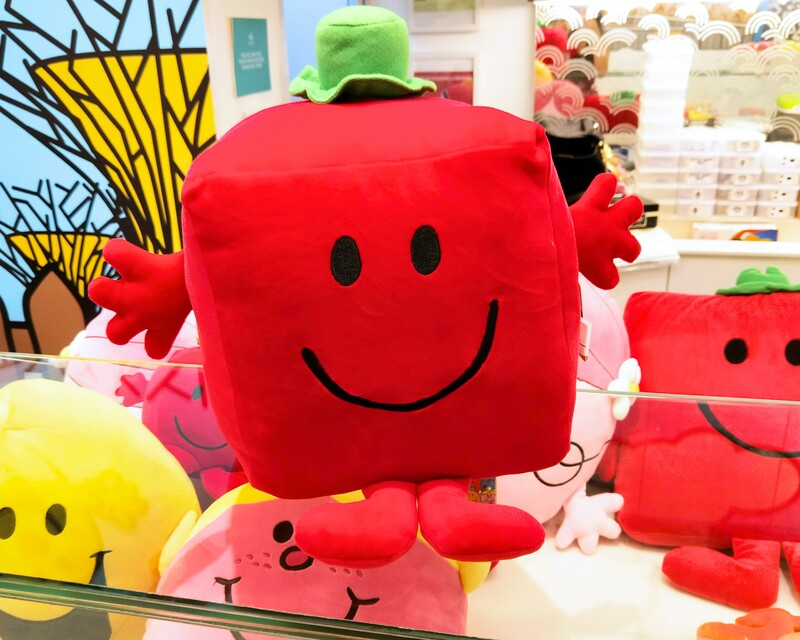 We couldn’t resist getting the Mr Happy Delightful Pancakes because how you can be upset looking at that cheerful face? The all-day breakfast option comes with a healthy side of salad, hashbrown, tempura mackarel otah, roasted portobello mushrooms and scrambled eggs. The cutest part of the dish was an actual bottle of Happiness In A Jar – which turned out to be kaya jam (coconut jam). Except for the kaya and the eggs which tasted a little bit dull, the rest of the food (especially the fluffy pancakes) was satisfyingly good. Want something more local? Try the Mr. Bump Knock-Out Nasi Lemak. This dish turned out to be a lot of people’s favourites, and the sambal chilli is the bomb. 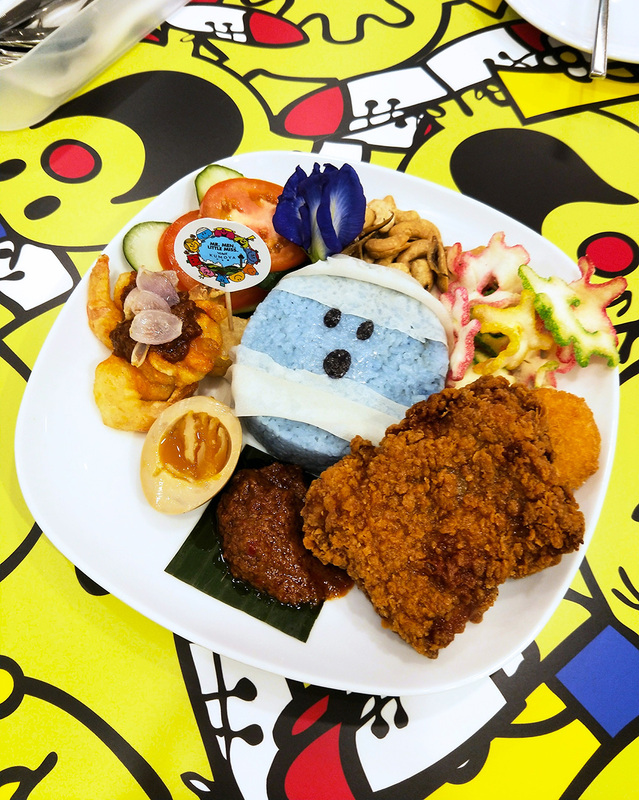 The nasi lemak also comes with a piece of crispy fried chicken, tempura sambal prawns, a potato croquette and a ramen egg instead of your usual fried egg. But we went ahead to order it just to see how it would turn out! Unfortunately, the mac and cheese wasn’t a super bright pink like in the menu; instead it arrived looking like it just got washed in dirty, dull pink cheese. Taste-wise, the mac and cheese could do with more sauce because I prefer really cheesy mac and cheese, but the meatballs and crispy bacon were delicious. There’s nothing special about this dish, but it did leave us with a happy tummy – mac and cheese is a comfort food anyway. Remember those cute little square books? 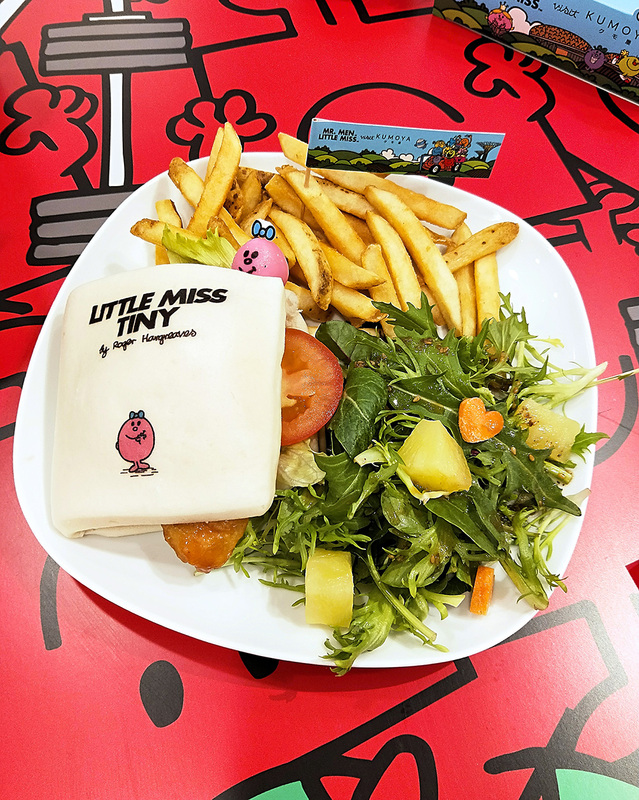 You can get your own little square book to eat with the Go big on Little Miss Tiny burger. The bao tastes like those pork belly buns, and is good. You can also choose from two fillings: a Sweet And Sour Tempura Fish ($19.90), or a Black Pepper Tempura Softshell Crab ($22.90). Definitely get this if you aren’t sure of what you want to order. 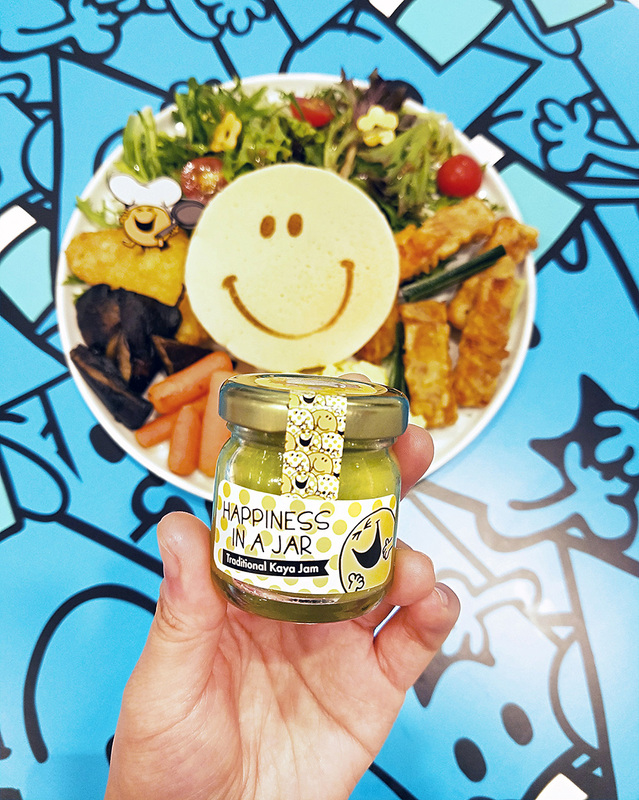 We tried the Mr Happy’s Cheerful Calamansi Tart that is a tangy tart infused with calamansi. It kind of reminded us of a lemon meringue tart, but calamansi-style. The dish also comes with a little pot of strawberry jam – if you think the tart is too sour, drizzle it with the jam. If not, just pour it over the soft serve. Another popular dessert at themed cafes seems to be the chocolate fondue. We loved how the mini donuts came topped with milo cereal and flower biscuits, and there was even an agar agar shaped like an ang ku kueh. There’s also marshmallows, fruits and various biscuits, and of course a cup of that Hokkaido soft serve. Skip the brownies – they were way too sweet and had a slight ‘artificial’ taste to it. 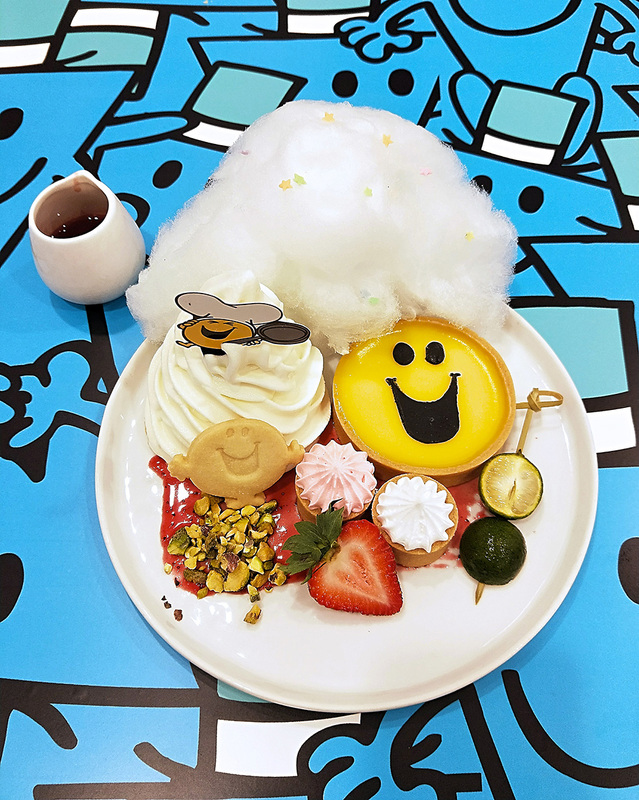 There’s also a Mr Strong Milo Red Velvet Waffles ($20.90) that’s full of milo crunch and milo sauce and a Mr Bump Pow-wow Sponge Cake ($17.90) that comes with kidney beans, sweet corn and gula melaka (it reminded us of a deconstructed chendol if it was revived as a cake). As for drinks, skip the Butterfly Pea Flowers juices and go straight to the frappes and coffees. Combining two of our favourite childhood snacks is the Milo Oreo Frappe – not too thick or too diluted, the frothy drink is a hit of chocolate-y goodness. For a caffeine shot, get the MMLM Iced Cafe Latte. The latte is not overtly sweet, and doesn’t leave behind a bitter aftertaste. It’s a bit steeper compared to a cup from Starbucks, but treat yourself because this is a much better cup of coffee than what you’ll get from ‘bux. There are also hot drinks just in case you decide to seek shelter from the rain in the cafe – but you’ve only got a Hot Sweet Cafe Latte ($9.90) and a Hot And Rich Chocolate to choose from ($9.90). You’ll be able to get your hands on huge plushies. Get them early because some of the plushies are single pieces. Other merch includes tote bags, keychains, files, and cups. How can you resist Mr Strong? Not willing to spend but want to bring home something from the cafe? 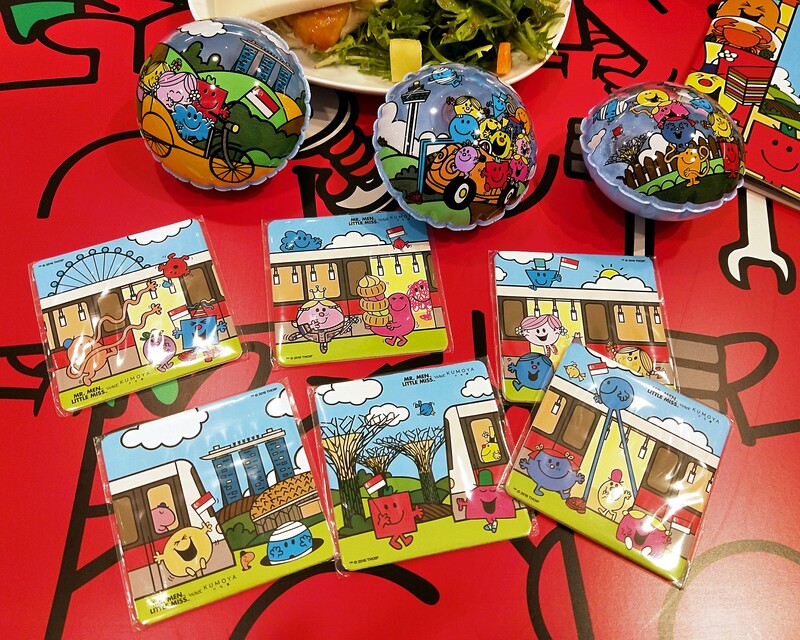 Every order of a drink will come with either an inflated fridge magnet or a coaster, which features snapshots of the Mr. Men and Little Miss in various local tourist spots like Gardens by The Bay and Marina Bay Sands. There are six different coasters and three different magnets to collect in total. If you’re planning on heading down to cafe, do note that there are a couple of rules you might have to take note of. Your dining time might be limited to 90 minutes during peak periods, and there is a minimum spend of $10 per person. 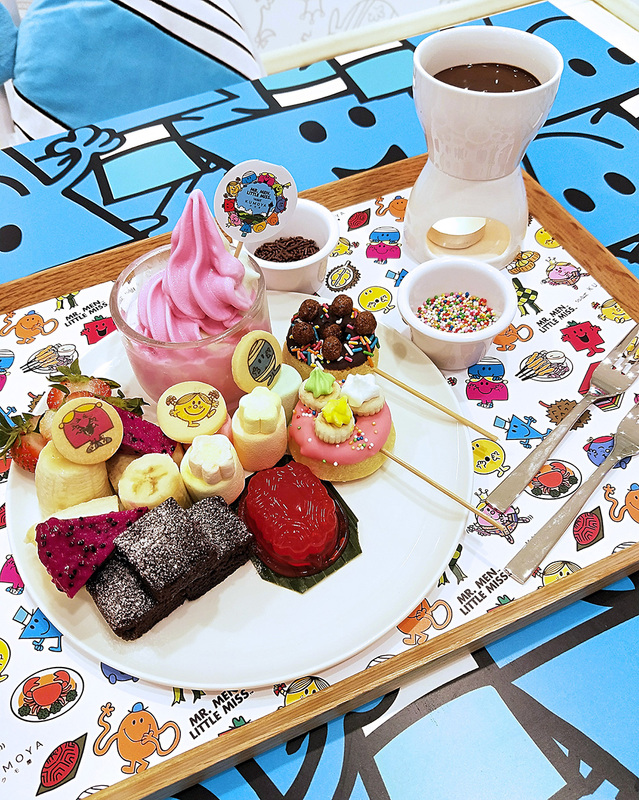 Want to visit more cute themed cafes?